If you like clean, easy to read guides, take a look at the Ozeki Phone System XE guide for Ruby developers. Would you like to know how to send/receive messages and make/answer voice calls? This page has these answers, and even more information about the dominant phone system. HTTP API enables you to get information from the PBX in real time and to control calls with HTTP requests. Take a look at how it works through the example of Call command. Call command can be used to initiate a voice call. It makes an API extension call a number and do tasks with the call. The tasks are declared in an OzML response document as seen in Figure 1. Please change the ozekixepbx.ip text to the ip address where the Ozeki Phone System XE is installed. On yoursite.com the address should be that where the sample applications are running. From the RailsInstaller.org download and install railsinstaller-windows 3.0.0-alpha2 with Ruby 2.0.0. From MySQL Connectors you need to download the proper version of Connector/C 6.1.1. After un-packing the file you need to copy the libmysql.dll file from the mysql-connector-c\lib directory to the RailsInstaller\Ruby\bin directory (By default it's in C:\RailsInstaller\Ruby2.0.0\bin). This is needed when you get the 'no such file to load - mysql2' message when testing. How to install and configure Ozeki Phone System XE. Download Ozeki Phone System XE. 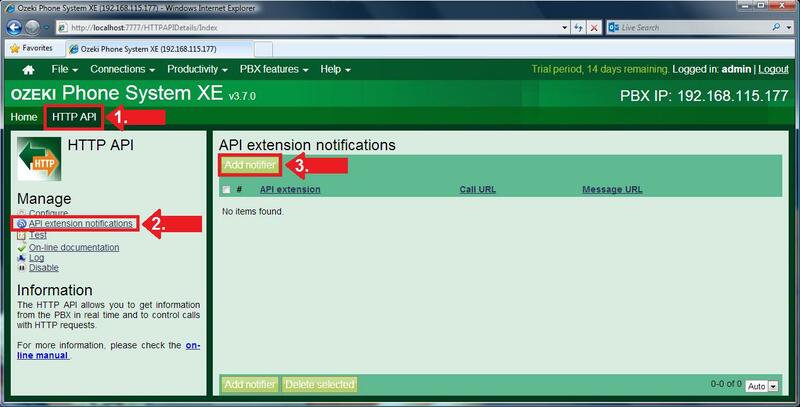 You will also need an API extension which you need to install in Ozeki Phone System XE. Read how to install an API extension. If you would like a more serious IDE, then it is a good idea to install Apanta Studio 3. It has a built in terminal, so it is needless to run the Git Bash application or a Command Prompt when using it. If you still decide to use the Git Bash application, then you can start it with the C:\RailsInstaller\Git\bin\sh.exe --login –i command. Most of the commands known from Unix can be used through the terminal thanks to the DevKit package which is part of the RailsInstaller. First, you create the application to be made with the rails ops_example command. After this enter the directory created for the application with the cd ops_example command. A few Rails versions requires to use the gem install mysql2 --platform=ruby -- --with-mysql-dir="C:\mysql-connector-c-6.1.1-win32" --with-mysql-lib="C:\mysql-connector-c-6.1.1-win32\lib\opt" command as an explicit operation. (This command assumes that you have extracted the Connector/C 6.1.1 to the C:\mysql-connector-c-6.1.1-win32 folder). You need to indicate in the Gemfile found in the ops_example directory, that you would like to use the mysql2 package. To do this you need to type in the following line: gem 'mysql2'. After this the bundle install command will install the package for you which you need to execute in the terminal. In the config/database.yml file you need to modify the accessibility of the database, which is by default set to http://localhost:3306 and you can connect to it with the root user. You need to generate two controllers, which can be done with the rails generate controller call (rails g controller call) and the rails g controller sms commands. The rails server command, in a shorter form the rails s command is used for testing. This will start the server, which runs default on the http://localhost:3000 address. Do not forget to configure the routing system in /config/routes.rb. To receive incoming calls the API extension notifications need to be set. Learn more about notifications here. 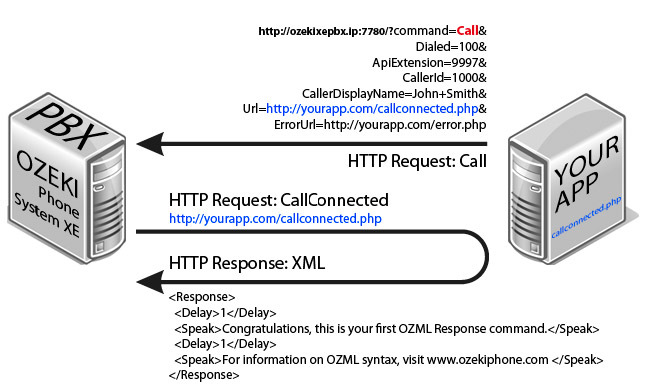 On the following figure you can see how to add an API extension notifier on Ozeki Phone System XE (Figure 1). 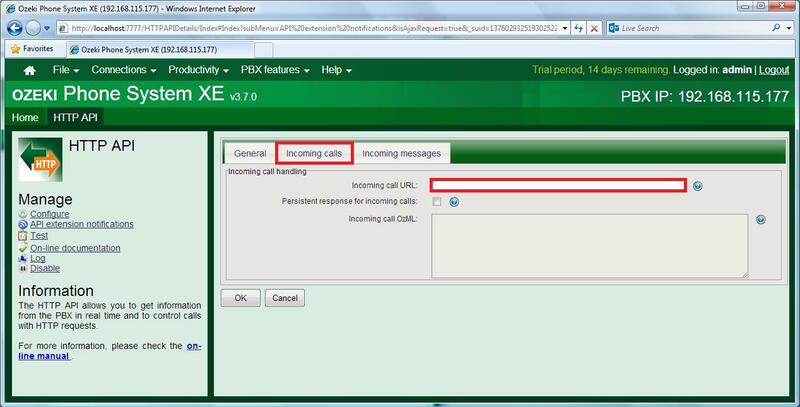 On the Incoming calls tab type in the Incoming Call URL for example this: http://yoursite.com/test_2.xml (Figure 2). This is the URL where the IncomingCall notifications are sent. The test_2.xml is written in OzML language (Code example 1). The code below waits 1 second, then the voice engine speaks the sentence in row 7. Then it waits 1 more second and speaks the sentence in row 9. To make a call, you need to make a CallManager class with a call method, this method needs three parameters. The dialled parameter is the number you want to call. The API extension parameter is the API extension added to Ozeki Phone System XE. The last parameter is an URL which points to an XML file. This XML file needs to be built using the syntax rules of the OzML language and can be generated dinamically. Find out more about the OzML language here. Copying the xml file to the C:\wamp\www directory the code segment below calls extension number 2000, using the 9999 API extension (Code example 2). To receive an SMS you need to set an API extension notification, you can read about notifications here. The initiation of the notification is the same that is written in the 'Receive incoming voice calls' section. After initiating the notification, on the Incoming messages tab, Incoming message URL you provide a PHP file, which will handle the received messages (Figure 3). To send an SMS you need to add an SMPP connection or add an SMS modem connection to Ozeki Phone System XE. The Ozeki Phone System XE offers a lot more options for Ruby developers. You can interact with existing calls, control and configure the PBX, you can introduce new communication techniques and media formats. How to Connect Smartphpne Devices? How to connect your ISDN phone line to the Ozeki Phone System XE?